Small size - 10" x 4" x 2.5. Model: BB11-001. 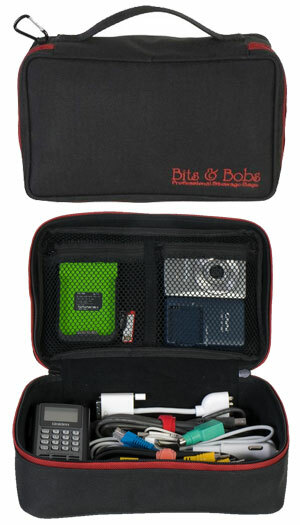 We all have stuff that we take on the road with us that we depend on. 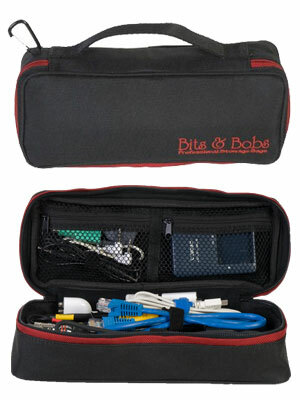 Bits & Bobs Professional Stowage Bags are the best way to keep those items safe and organized. Whether it's adapters, antennas, batteries, cables, cameras, connectors, ear buds, flash memory, location sound recorders, micro projectors, portable HDD's, power supplies, voltage convertors, video games, make up, baby bottles or just plain old widgets. We think you get the idea. Bits & Bobs Professional Stowage Bags are made from 600 denier polyester with padded linings and zippered cargo pockets in the lid. 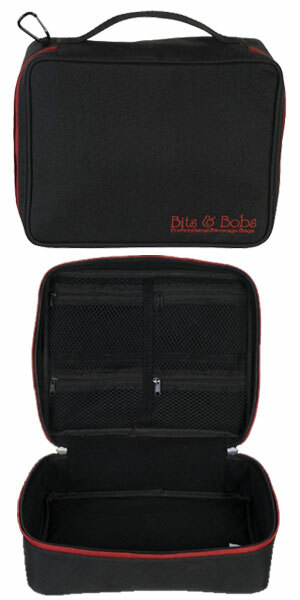 The exterior heavy duty zipper with large pull tabs allows for ease of operation under the most demanding circumstances. They are extremely lightweight, come in three sizes, and have a limited Lifetime Warranty.